It was a dominant display from the Blues and there was a palpable sense of relief around the ground when Omar Bogle finally scored in the second half to make their dominance count. Scunthorpe never looked like finding the net at the other end and the hosts made sure of the points thanks to a fine finish from Jamal Lowe late on. Kenny Jackett stuck with the same side that won at Walsall earlier in the week, with skipper Brett Pitman playing just behind Bogle. But with James Vaughan having not recovered from a back injury, Lloyd Isgrove took his place on the bench. It was a blustery afternoon on the south coast, with the conditions clearly making life difficult for both sides. So it was perhaps understandable that the passing on show was wayward at best in the opening exchanges. Lowe and Viv Solomon-Otabor were looking lively on the wings, however, and the former had an effort that sailed narrowly over. It was pretty quiet at the other end of the pitch, although a tame effort from Tony McMahon flew comfortably into Craig MacGillivray’s arms. Bogle had a couple of shots blocked, but the first decent opening did not arrive until 26 minutes had been played. Solomon-Otabor threaded a fine pass through to Lowe, who took the ball around Iron keeper Jak Alnwick, but – from a tight angle – could not force it past defender Harrison McGahey. Pompey were enjoying plenty of possession and applying pressure on the visitors’ defence as the first half progressed. And they almost broke the deadlock just before the interval after Solomon-Otabor’s delivery was only cleared as far as Bogle. He managed to dig out a shot that Alnwick did well to save and when Pitman put the ball back into the centre, a stretching Lowe could not make a clean connection with the goal gaping. Solomon-Otabor then slipped off the ball and required treatment on the pitch, but was okay to continue. It was only a brief return to action for the loanee, though, who soon had to make way for Gareth Evans. The substitute had the first chance of the second half with a drilled effort from the edge of the box that was deflected past the post. He then hit another 20-yard effort narrowly wide after the ball had been worked to him from a throw. Clear-cut openings were proving to be at a premium, although Alnwick leapt out a bending Lee Brown attempt on the hour mark. A longer-range strike from Tom Naylor then fizzed past the post, as the hosts continued to dominate without really going close to scoring. Pompey were trying their best to raise the tempo – with the wind still swirling around the ground – and Brown was denied what would have been a soft penalty for an apparent push. Alnwick did well to stop his side falling behind on 68 minutes, tearing off his line to bravely prevent Lowe from converting Evans’ ball into the box. But the Blues finally made their pressure count moments later following a foul on Lowe by Rory McArdle. Evans’ free-kick was flicked on for Close, but BOGLE took the ball and spun sharply before leaving Alnwick flat-footed with his finish. The hosts tried to put the result beyond doubt and Brown’s cross was just too high for Pitman, while the left-back then saw a shot deflected behind. Bogle received a warm reception as he made his way off the pitch to be replaced by Oli Hawkins for the final few minutes. And the win was wrapped up on 87 minutes when LOWE collected the ball from the right, used his touch to make space and then lashed home a fine finish. It meant that the Fratton faithful could relax for the closing stages, as Pompey comfortably saw the game out. 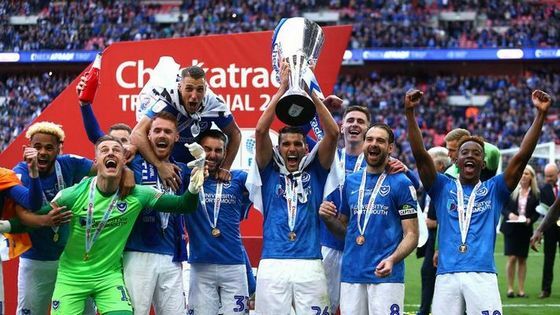 Pompey began 2019 with victory at Fratton Park, but were made to work hard for the points by a struggling AFC Wimbledon side. It looked like a comfortable afternoon might be on the cards for the league leaders when Jamal Lowe gave them an early lead. But the hosts missed some decent chances to extend their lead and a stunning strike from Kwesi Appiah brought the Dons level. That seemed to spark the Blues back into life, though, and Ronan Curtis soon headed them back in front to secure the win. Kenny Jackett made three changes from the side that won convincingly at Fleetwood at the weekend. Oli Hawkins recovered from an ankle problem to replace Brett Pitman up front, while Brandon Haunstrup came in for the injured Lee Brown at left-back. The other switch saw Ben Close make way for Gareth Evans, who was rested for the final game of 2018 at Highbury. There was a minute’s applause before kick-off in memory of former Pompey and Hampshire cricket star Mike Barnard, who sadly passed away before Christmas. It was a quiet start to the contest, both on and off the pitch – with some New Year revelries perhaps explaining the muted atmosphere in the opening stages. But the noise levels soon grew, as the hosts took the lead with the first proper chance of the game on eight minutes. Curtis collected a cross-field pass from Anton Walkes and fired in a low shot that was saved by Tom King. But the keeper could not keep hold of the ball and LOWE was quick to capitalise, dinking a neat finish into the net. Pompey were dominating possession, but there was not an abundance on clear-cut opportunities to excite a sell-out crowd. Ben Thompson wasted a decent opening, swiping at thing air after Walkes’ ball into the box had been laid off by Evans. A couple of other dangerous moments from the hosts were ended by an offside flag, as the Dons struggled to find a foothold in the game. Lowe was proving a particular nuisance and after showing some nifty footwork inside the box, saw his low shot saved by King. His clever chipped pass into the box then had to be nodded away by Terell Thomas before Thompson could capitalise. The visitors finally threatened just before the break when former Pompey winger Andy Barcham burst clear, but a superb Jack Whatmough challenge inside the box halted his progress. It was still a fairly sedate affair once the action restarted and a wayward header from Mitch Pinnock was not going to trouble Craig MacGillivray. Kwesi Appiah was then perhaps fortunate to avoid a booking following a late challenge on Matt Clarke, with the Blues defender quickly back up on his feet. But the hosts should have doubled their lead on 54 minutes, as a fine Lowe pass sent Curtis through on goal, only for the Republic of Ireland international to drag his shot wide. Curtis was soon back to his best, however, stealing possession and cutting the ball back for Evans, whose side-footed effort was kept out by King. Wimbledon tried to make Pompey pay for those missed chances and suddenly enjoyed a spell of pressure. But one strike from Anthony Hartigan flew high over the crossbar, while another was straight at MacGillivray. It was the visitors on top, though, and Jackett made a double change on 69 minutes to try to negate their threat. Evans and Hawkins were the men to make way, with Close and Pitman adding fresh legs to the midfield and forward line respectively. But it was Lowe who had a chance to doubled the lead, only to head a Curtis cross wide from just a few yards out. And the hosts were made to pay for their profligacy when Appiah unleashed a superb long-range strike that left MacGillivray helpless. Thompson had a shot blocked as Pompey went back on the attack, while an effort from Curtis was comfortably dealt with by King. But CURTIS did restore their lead moments later, rising above his man in the box to nod home a great cross from Thompson. The Dons threw men forward in an attempt to equalise for a second time, but Pompey saw out the closing stages to start the year on a high.